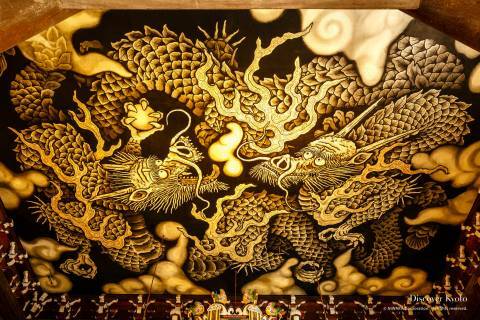 Nishiki Market is a place where you can enjoy delicacies from not only Kyoto but all around Japan. 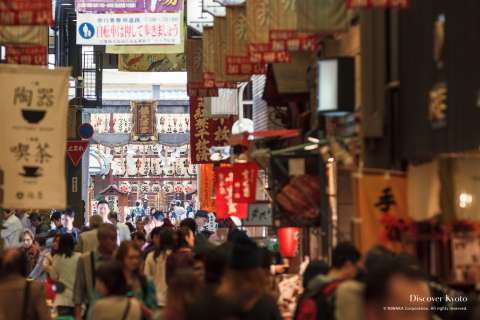 Situated right in the middle of Kyoto City, the market street offers over 120 stores that specialize in food and kitchenware. If you go early in the morning, you might also bump into some of Kyoto’s top chefs who shop at the markets for fresh produce. All of your senses are heightened when you enter the vibrant market. Shop assistants calling out ”irasshaimase” (“welcome”), you can smell tantalizing aromas as you walk past each store, your taste buds get a good workout with all the amazing food samples and your eyes will be very busy looking at all the visually beautiful and interesting food at the market. Although it was difficult to just pick a few, we found some pretty unique and delicious food you can buy at the market. Senbei are a type of rice crackers that come in various sizes and flavors. Typically sold in potato chip sized packets, at Nishiki you can find large senbei sold individually that you can eat while walking. The rice cracker was chewy and it was really interesting to taste shiso (perilla) on a senbei, but it blended in nicely with the other Japanese flavorings. If you want something less daring, you can also enjoy many simpler flavored senbei such as soy sauce or black pepper. 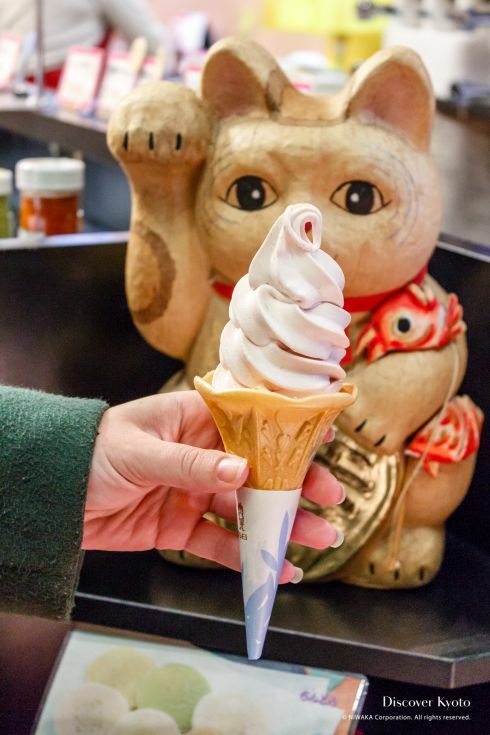 While matcha (green tea) ice cream is common in Japan, the Nishiki Market is probably one of the few places in Japan where you can find ice cream made with shichimi (a Japanese spice). Shichimi is made from seven different ingredients and is typically used to spice up ramen noodles and grilled dishes. The soft pink-tinted ice cream may appear non-threatening at first but as you bite in, wait for a few seconds. What tasted like a creamy vanilla ice cream turns into a spicy shichimi explosion! This is exactly what it is. 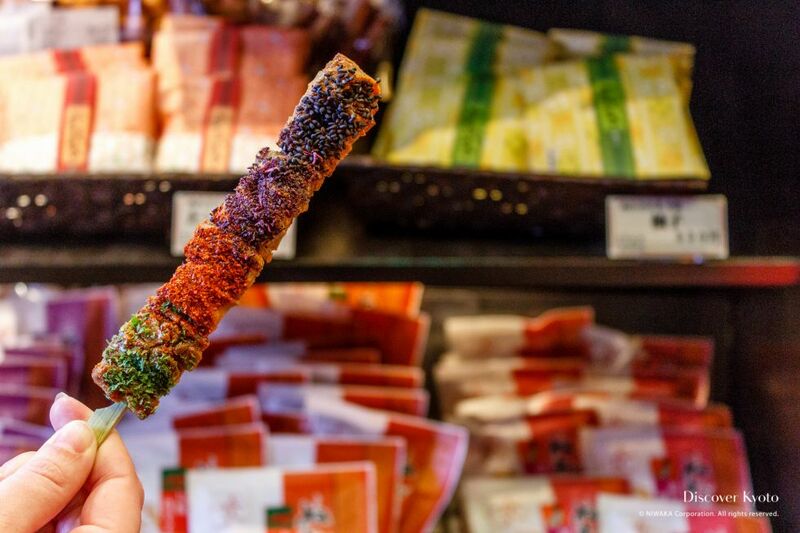 A mini octopus on a stick. Or is it…? If you want don’t want to know what kind of surprise awaits you inside this snack, skip to the next paragraph. When you bite into the octopus you will find a small creamy quail egg inside. We don’t know exactly how they got that quail egg inside that tiny octopus, but the texture of the yolk works well with the octopus. The octopus itself is chewy and is smothered in a soy sauce-like sauce. 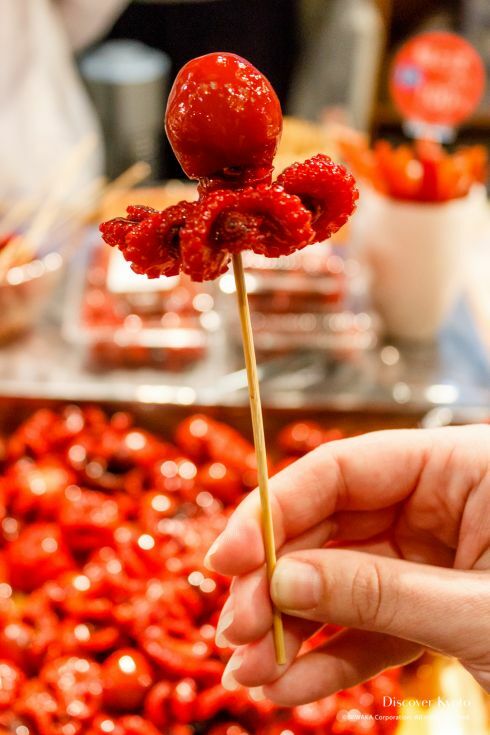 Being quite popular, you can find these octopus skewers at a few different fish mongers at the market. You can probably smell the pickled Japanese vegetable (tsukemono) stores before you see them. There are a few tsukemono stores in Nishiki Market where you can smell, taste, and buy all kinds of different pickled Japanese vegetables. A very popular Japanese food, tsukemono are usually eaten with rice or as a side dish. 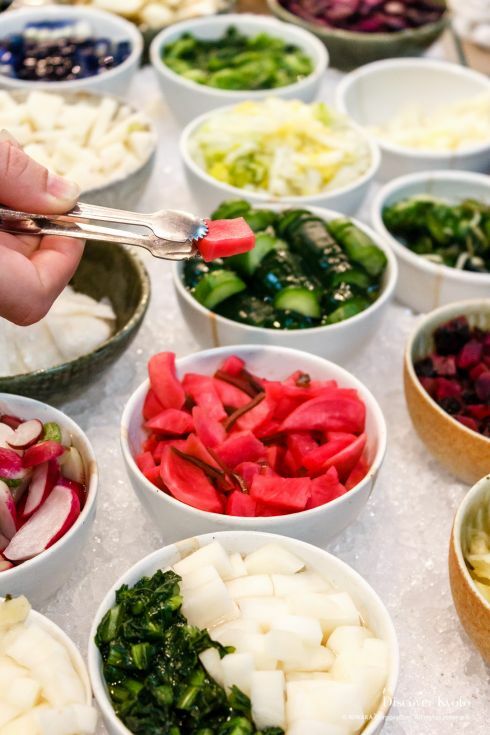 There are various types of tsukemono, for example: shiozuke, (pickled vegetables made with salt), suzuke (pickled vegetables made with vinegar), and misozuke (pickled vegetables made with miso). If you’ve ever visited a Japanese restaurant, no doubt you’ve been served some tsukemono with your bowl of rice. If you’re a first timer you can always try the many samples some stores have to offer first. Of course, even if you’re not, you can try the samples anyway. 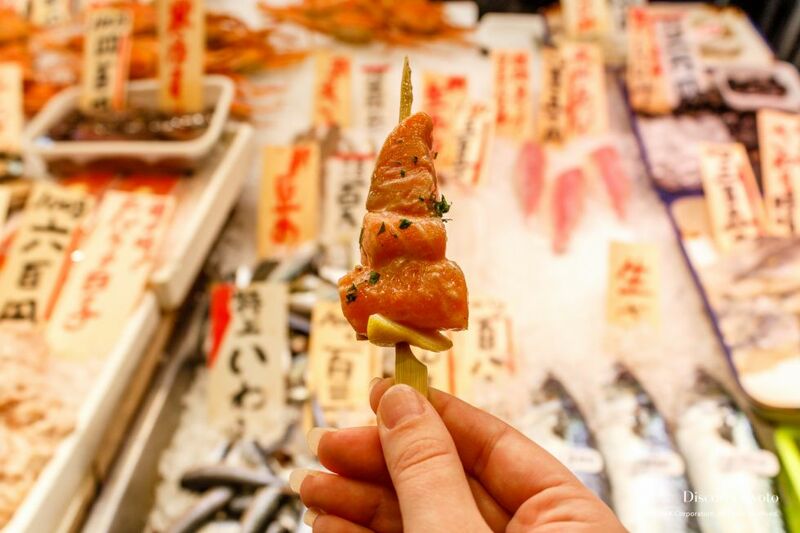 At this point you’re probably wondering why most items bought at the Nishiki Market come on a skewer. This is because Nishiki is one of the few places in Japan where eating while walking is considered acceptable. 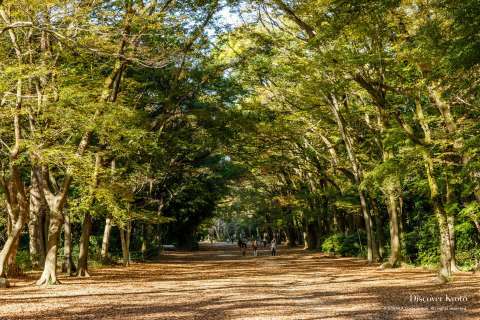 Although you won’t be breaking any laws, eating while walking is usually frowned upon in Japan. One of the popular skewer items sold at Nishiki is the “ten”. Ten are battered and fried ingredients, usually made with seafood and vegetables. 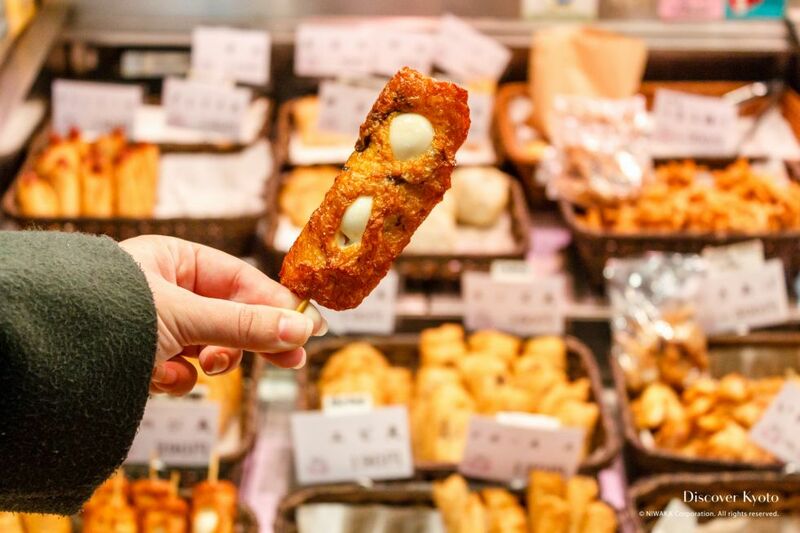 Here we have two quail eggs wrapped inside a batter fried fish cake. A protein lover’s dream! The fish cake and egg white made this tasty snack very chewy. I was kind of relieved when I reached the egg yolk. You can pretty much never go wrong with fried food and as expected this ten was heavenly. Sesame seeds, goma in Japanese, are commonly used in Japanese cooking. Both tan and black seeds are used in a variety of sweet and savory dishes, and the health benefits of the seeds are often praised by health experts. 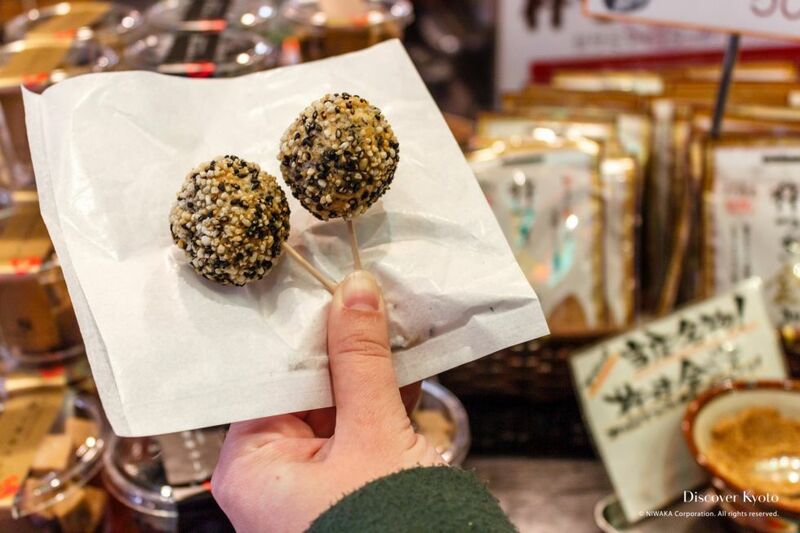 We found these ball-shaped sesame dumplings at a sesame specialty shop. They have a sprinkle of golden sesame on the outside and black sesame seed paste inside (the best of both worlds). Although a touch more bitter, the texture and flavor of the black sesame paste is often compared to peanut butter. These sesame balls tasted more savory than sweet, but it’s just sweet enough to have it as a dessert. A healthy dessert! To all sashimi lovers, good news! Now you can eat sashimi on the go with this sashimi skewer. We chose the salmon but you can also enjoy tuna or even squid skewers, as well as a few other interesting seafood options. The tender bite sized sashimi was flavored with a dash of lemon juice.